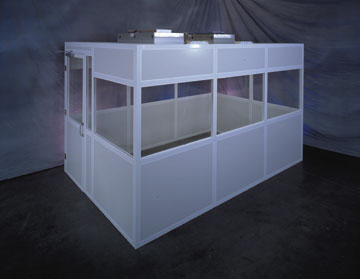 The VFCS (Vertical Flow Component System)/Softwall Cleanroom is a portable unit with steel tubular legs. 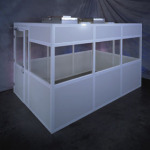 The design of the system which includes frame, MAX 8000 Series, lights and vinyl curtain sets up fast on your site without the need for special tools. The curtain which is 20mil. vinyl extends downward to within 12″ of the floor. This curtain acts as an air containment device to assure Class 100(ISO 5) air flowing down and over the critical work area.